Girly and glitzy was the name of the game for Tamra’s birthday cake. It doesn’t get any more girly or glitzy than pink and gold glitter! This cake was a two tier to serve about 25 people. 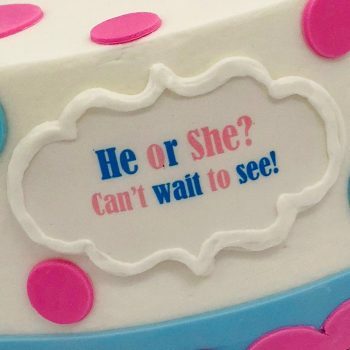 The top tier was iced in a smooth bubblegum pink buttercream. 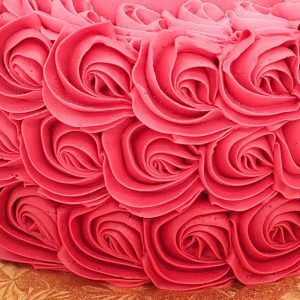 The bottom tier was iced in pink ombre buttercream rosettes. We love ombre designs that incorporate 3-4 different shades for the full pink effect. In this case, the darker shade was on the bottom and we lightened the buttercream as we went up the cake until we got to the shade of the top tier. So much pink! After the cake was totally pinked out, we were able to decorate it. 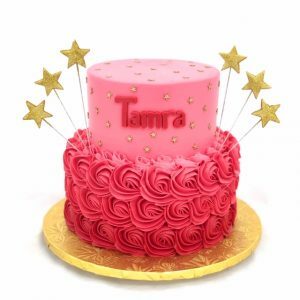 We started by adding Tamra’s name on the top tier in the darker pink shade, so it would contrast with the buttercream color. We then cut out dozens of tiny stars and painted them gold. We placed these sporadically all over the top tier. Lastly, we added the gold glitter star bouncers, which were made in advance. 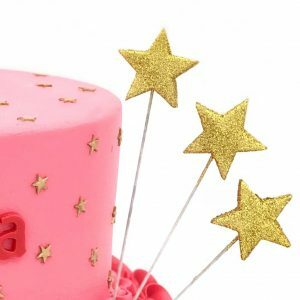 We cut a medium-sized star out of fondant, skewered it and and coated it with edible glitter. So glitzy and girly!